I have a new musical instrument/noise making device! 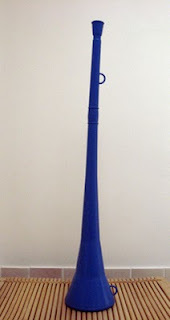 It's called a 'vuvuzela' also known as a 'stadium horn' and was given to us by a friend following his recent trip to South Africa. 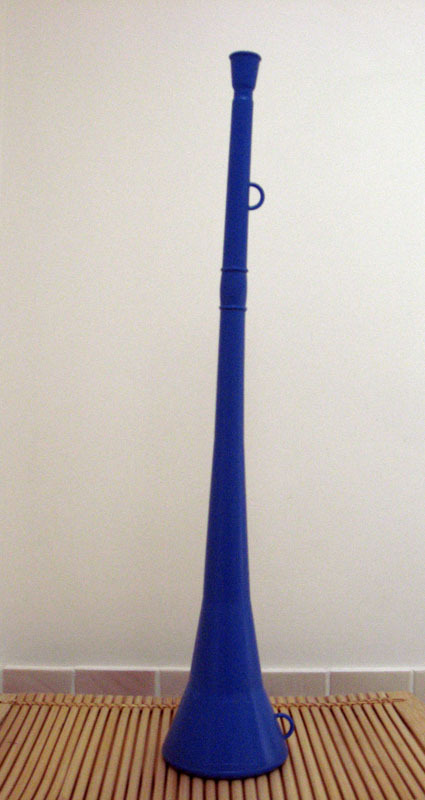 The vuvuzela is basically a metre long plastic horn and to play it (according to wikipedia) "requires some lip and lung strength to blow" and it emits "a monotonous noise like a deep foghorn or an elephant." So far the only sound I've been able to make is akin to someone blowing their nose and it really hurt my cheeks! Vuvuzelas are synonymous with South African football, so if you're planning on watching the world cup this summer, you're going to hear this foghorn noise A LOT! Here's what it's supposed to sound like. This is definitely not the kind of instrument you want falling in the hands of your 7yr old nephew.